Chad Edward Moeller [MOE-ler] (born February 18, 1975) is an American former professional baseball catcher. He played in Major League Baseball (MLB) from 2000 through 2010 for the Minnesota Twins, Arizona Diamondbacks, Milwaukee Brewers, Cincinnati Reds, Los Angeles Dodgers, New York Yankees, and Baltimore Orioles. Moeller attended the University of Southern California (USC) and played college baseball for the USC Trojans baseball team. In 1996, he was an All-Pac-10 Conference selection. He was drafted in the 7th round (187th overall) of the 1996 Major League Baseball Draft by the Minnesota Twins. Moeller played with the Minnesota Twins (2000), Arizona Diamondbacks (2001–2003), Milwaukee Brewers (2004–2006), Cincinnati Reds (2007), and Los Angeles Dodgers (2007). In four seasons with Minnesota and Arizona, Moeller batted .254 with 11 home runs, 56 RBI, 31 doubles, 4 triples, and two stolen bases in 188 games. He also got his first World Series ring when the Diamondbacks defeated the Yankees in the 2001 World Series. When he was with the Brewers, Moeller was used increasingly only for calling games with staff ace Ben Sheets. He did however hit for the cycle on April 27, 2004. He was the first Brewer to hit for the cycle at home, and the first since Paul Molitor did it on May 15, 1991 at Minnesota. In January 2006, Moeller was named to the USA's provisional roster for the 2006 World Baseball Classic. Just prior to the 2006 All-Star break, Moeller was designated for assignment by the Brewers, primarily due to his low batting average (.184). After clearing waivers he joined the Triple-A Nashville Sounds. On July 15, 2006, he caught a combined no-hitter with the Sounds' Carlos Villanueva, Mike Meyers, and Alec Zumwalt. Moeller began the 2007 season with the Cincinnati Reds. After splitting time between Cincinnati and the Triple-A Louisville Bats, he was traded to the Los Angeles Dodgers for cash considerations on August 11, 2007. On November 27, 2007, Moeller signed a Minor League contract with an invitation to spring training with the Washington Nationals. He was released by the Nationals on March 10, 2008, and signed a minor league contract with the New York Yankees the same day. The Yankees purchased his contract on April 14 following injuries to Jorge Posada and José Molina. On April 25, 2008, he was designated for assignment because it had been thought that Posada would be able to play through his injury. Posada, however, was placed on the 15-day disabled list on April 28, and the Yankees added Moeller back to the active roster upon clearing assignment waivers on April 30. He remained on the active roster following Posada's return from the disabled list, but was again designated for assignment on July 31 following the acquisition of Iván Rodríguez. He cleared waivers and returned to Triple-A Scranton. 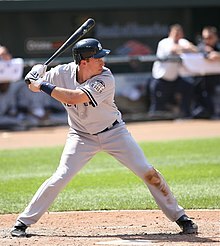 While with the Yankees, Moeller played third and first base twice each, the first time in his career he played a position other than catcher. Moeller rejoined the Yankees on September 1, when the rosters expanded from 25 to 40. Moeller became a free agent after the season. Moeller with the Baltimore Orioles in 2009. Moeller signed a minor league contract with the Baltimore Orioles on December 12, 2008, and made its Opening Day roster as a backup catcher. After batting .200 with a .259 on-base percentage in fifteen games, he was designated for assignment on May 29 when the Orioles promoted top catching prospect Matt Wieters from the Triple-A Norfolk Tides. Moeller cleared waivers five days later and was assigned to the Tides. Moeller was recalled to Baltimore on August 7 when the Orioles traded catcher Gregg Zaun to the Tampa Bay Rays. Moeller was signed to a minor league contract which included an invitation to spring training with the Baltimore Orioles on December 4, 2009. He was granted his release on April 1 after not making the team. On April 3, Moeller signed a minor league contract with the New York Yankees. On May 20 he was called up to the Major League roster to back up Francisco Cervelli after another injury to Posada. He played his first game of the season on May 29, starting against the Cleveland Indians. On June 21, Moeller was designated for assignment to clear room on the roster for outfielder Colin Curtis, returning to the Scranton Wilkes-Barre Yankees on June 26. He was called up again on September 1. Moeller is the cousin of MLB players Chris Cron, C. J. Cron, and minor leaguer Kevin Cron. Moeller now teaches, coaches, instructs, has camps, and does video analysis of catching and hitting instruction for youth baseball. ^ "7th Round of the June 1996 Draft –". Baseball-reference.com. Retrieved September 1, 2010. ^ "Moeller becomes fifth Brewer to hit for cycle". ESPN.com. April 28, 2004. Retrieved September 1, 2010. ^ "Memphis vs. Nashville - July 15, 2006". Minor League Baseball. July 15, 2006. Retrieved October 28, 2018. ^ "Orioles select contract of CA Matt Wieters" (Press release). MLB.com. May 29, 2009. Retrieved September 1, 2010. ^ "Orioles grant Moeller an outright release". The Baltimore Sun. April 1, 2010. Retrieved April 1, 2010. ^ "Yanks call up Moeller and Russo". MLB.com. May 20, 2010. Retrieved May 20, 2010. ^ "Cano's slam makes Hughes' win easy". MLB.com. May 29, 2010. Retrieved May 29, 2010. ^ "Transactions | yankees.com: Team". MLB.com. March 19, 2010. Retrieved September 1, 2010. ^ Collins, Donnie (September 1, 2010). "Yankees call up Albaladejo, Golson and Moeller". The Times-Tribune. Retrieved September 1, 2010. ^ Skoda, Jason P. (June 5, 2011). "Siblings C.J. and Kevin Cron are both expected to go high in Major League Baseball's amateur draft – Ahwatukee Foothills News: Sports". Ahwatukee.com. Retrieved July 12, 2014. ^ "Baseball Clinics Schedule Information". www.chadmoellerbaseball.com. Retrieved July 3, 2016. ^ "Chad Moeller « Scottsdale Batting Cages". www.scottsdalebattingcages.com. Retrieved July 3, 2016. Wikimedia Commons has media related to Chad Moeller. This page was last edited on 23 April 2019, at 14:21 (UTC).